Reproduced by Anna Estarriola (born 1980) is on display in the Basement at Galerie Anhava. The work addresses issues of replication and reproduction. 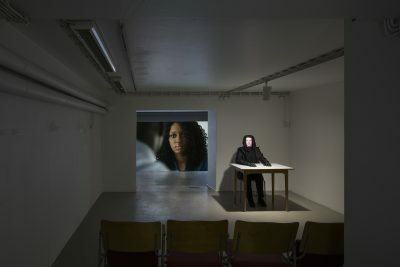 Specially constructed in the gallery’s basement space, it considers the thematic of understanding and communication and is based on the experience of stepping into a cinematic scene to encounter a different, produced reality. The video piece is part of an entity constructed in the space with a screen, rows of seats and a narrator figure front of the screen. The narrator, composed of the elements of a sculpture and a video, is a partly two and three-dimensional figure, commenting on, translating and interpreting for the audience not only the work itself but also the situation of displaying it. The narrator thus reproduces at the same time the video displayed in the space. Estarriola is interested in, and perplexed by, humans and inter-human communication. In a manner typical of her work, the present piece combines the elements of the moving image, sculpture and the performing arts. The focus is on the individual’s personal experience and the relationship between the viewer, the artwork and the artist. Estarriola’s works are touching, funny and multi-layered, combining different means of expression in a fresh and humane way. Anna Estarriola (born in 1980 in Catalonia) holds the degrees of Master of Fine Arts from the Department of Sculpture of the University of Barcelona (2004) and the Department of Time and Space Arts of the Finnish Academy of Fine Arts in Helsinki (2009). Her solo exhibition Staged is currently on display at the Pori Art Museum and her work has been recently exhibited in the collections exhibition of the Kiasma Museum of Contemporary Art (2016) and at Forum Box (2016) and Galleria Huuto (2015), among others. Anna Estarriola was awarded the AVEK Award of the Promotion Centre for Audiovisual Culture in 2015.